Remember high school? Wait! Don’t go back to all that teen angst, peer pressure, and SAT prep stuff. But do go back to History class. Did you have that one teacher that could remember the exact date that that one obscure person did that entirely insignificant thing that was so extremely important (but apparently only for the test)? Well, I had a class like that and a teacher like that, and neither of them was my favorite part of high school. While I thought I enjoyed historical fiction, the combination of history and mystery didn’t work for me in this book. It felt… overwhelming and clunky, like info for a test that I would need to study for later. And while I was prepared for (and eagerly expecting) a bard-based ghost story, I got a bunch of insane homicidal witches instead. I picked this book up for $1.00 at my local Goodwill store and I’m thankful that it was such a bargain. I did not enjoy it. And it was not just because of all the history, I just wanted it to be a different story. Caught in a web of evil, Kate Stanley tangles with a legendary curse, a witch-haunted blade, and all-too-modern murder. What price genius? Macbeth is so famously cursed that many actors refuse to name the play aloud. Kate Stanley, Shakespearean scholar and theater director, dismisses the curse as superstition, but–as the cast begins rehearsals at the foot of Scotland’s Dunsinnan Hill–evil begins to stir. Actors go missing, and a trench is found filled with blood. Then Kate discovers a local woman dead in circumstances that suggest ancient pagan sacrifice. Marked as either suspect or future victim, Kate races to find a dangerous, alternate version of Macbeth said to contain actual rituals of witchcraft–and Shakespeare’s darkest secret. You’re beautiful when you’re angry, Kate. Not smart, maybe, but beautiful. This is book 2 in the Kate Stanley series, and I feel that maybe my aversion to this book is because I did not read book 1 and am therefore not connected to any of the characters. Plus, I do not think that Kate is that smart. A few of the deaths that occurred can actually be attributed directly to her. Hello, GPS tracking!!! So, first negative, Kate – not a fan. When you can’t relate to the main character in a book that is told from the first person perspective, it makes it hard to feel connected to the story as a whole. Her voice became grating and it was difficult to finish this book, but Kate’s character wasn’t the only reason. There were SO many characters in this book, and they popped in and out faster than folks get killed off in Game of Thrones. Play actors and historians, nieces and secret spies, all of them are fair game in what is supposed to be a mystery/horror, but what ends up more like a Shakespearian snuff book. OK, maybe that’s a little harsh. And then there were all the ancient artifacts: knives and mirrors and cauldrons and manuscripts and letters, oh my! Seriously, were we really expected to keep up with all those items, their histories, and significance, plus which items had copies and doppelgangers? Geez, Louise Kate! We have one rule in this house. Don’t go up the hill alone. Positives: if you do consider yourself a Shakespeare aficionado, you will enjoy this alternate look at his life, his possible “origin story”, and the darkness beneath Macbeth’s most famous scenes. Where did all of his talent come from? Was he in league with witches and dark magic that imbued him with an uncanny knack for telling stories that would impact millions throughout the ages? Well, it’s something to think about. But really, that’s about all I got from this book. The story I was expecting had a spine-chilling ghostly stage haunting, but the book I got was a witch and warlock-heavy bloodbath (at times literally) that seemed to stretch on forever through dual timelines and across two continents. If that’s your thing, dive in. I, however, very nearly DNF’d it. Sample the audiobook here (courtesy Youtube). 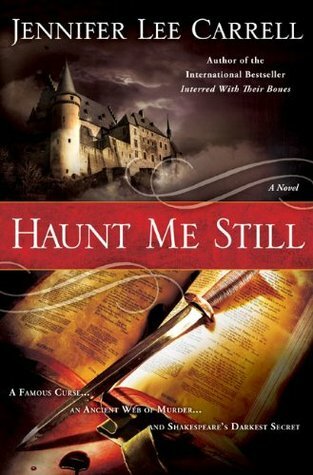 Jennifer Lee Carrell is the internationally bestselling author of two Shakespeare thrillers, Interred With Their Bones and Haunt Me Still, as well as a work of history, The Speckled Monster. Born in Washington, DC, she grew up in Tucson, Arizona. After earning degrees in literature from Stanford, Oxford and Harvard Universities, she taught literature and writing at Harvard. Later, she became the classical music, opera, and dance critic for the Arizona Daily Star. 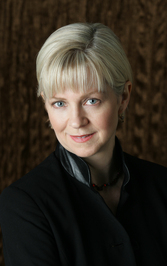 She’s also written a number of pieces for the Smithsonian Magazine, as well as a few screenplays. She lives in Tucson with her husband, daughter, two dogs, and three cats. She is currently at work on a historical novel about the painter Jan Van Eyck. I am not a Shakespearian aficionado so It doesn’t sound like an exciting read. It really sounds like it’s a lot going on.Thank you for the review! Oh, man. This is disappointing since I was pretty excited about this one. I love Macbeth. And ghost stories. Sounds like it doesn’t deliver, though. Removing from TBR list. I have too many books on there anyway. 😉 Thanks for the feedback!! !